"Everything sounds the same so you can't even tell the songs apart!" That was the most usual criticism launched against melodifestivalen as I grew up. People who didn't listen properly thought everything was too streamlined and lacking in variety. I hated to hear that year after year. Yet here I am, finding myself thinking the same thing. Most of the entries of 2018 seem to be hatched out of the same egg. They are all similarly produced, they are all born out of the same ideas. Write a slick, slightly generic, radio-friendly song and get a slice of the Melodifestivalen success cake. To me it seems that the effort made this year is to get to the final and have your song played on the radio. Not a single song gives the impression that anyone tried to write a winner. I thought 2017 was lukewarm but that was just a start. Semi four does very little to change this impression. A piece of beautifully sung but totally pointless fluff. Like a leftover from a local musical or a reject entry for Melodifestivalen 1994. Possibly a contender for fifth place if the viewers go for someone who can actually sing, like they did previous weeks. This is the entry I pin my hopes upon tonight. Not because it would be sheer brilliance but because Sweden would need a star like Elias Abbas - a young and positive and adorable talent from the "problematic suburbs". I wish for him to take Sweden by storm and establish himself as a household name even though that's rare for new MF talent these days. Another echo from a time gone by. This song is similar to "Killing Me Tenderly" - but a whole lot weaker - and that only made 7th place in its semi back in 2009. Felicia herself is really good but that won't help at all. There hasn't been as many humour entries this year after all but here comes the one that might knock Sweden over. It is really warm hearted and likeable - and also there is a pretty good song in there as well - but the whole dansband parody concept feels a bit worn out. Nothing new and nothing that will shake the audience and that is perhaps what we've been missing the most this year. This one makes me think of Serbia's entry in Kyiv 2017. You won't remember that one. Few people will. It was flawless in many ways but didn't have a drop of personality. Same story here. Fine as long as it goes on but what is the point of it being here when it has nothing to say? This is what Salvador Sobral sounded like to a Swedish audience? It is very nice indeed and Felix is a good vocalist but maybe this is a bit too much of a copycat so soon after the Portuguese victory and a bit too far removed from what kind of song Swedes would identify as their own at the ESC. In many ways it would be Mariette's turn to win. She is an excellent performer and a bubbly personality. However - her song is good but not outstanding. Should be a clear finalist this week but would Mariette be better off not having to go to Lisbon? We are already at week three and yet there has been no real obvious winner in sight. It seems the people on location in Malmö see great things in the making but I only have the one-minute clips and I am maybe not as convinced. So far I think MF 2018 is a stronger collection of songs than we had a in few years but the final really runs the risk of becoming as streamlined as it has been lately, where slick visuals beat music and performance skills every time. Something as unusual as a solid piece of songwriting (in general the songs are better in this respect this week, not so many whooo's and oooh's and yeah's instead of real lyrics) - this is a singer liked by the people and a song that would have won hands down in Denmark or in Malta. Not really my bag even though I understand what others see in this. I have a thing for the hopeless entries that I know nobody will vote for. Unless Barbi makes a mess of this live - reports suggest she might do just that - this could be one of the songs I'll keep listening to, but it has no hope of doing better than 6th at best tonight. Everyone does the link to Sweden 1987 here, this makes me think more of Herreys' "Sommarparty". Every single component in this makes me cringe and I have no idea how anyone thought this would make a great entry in 2018. Panetoz minus Panetoz equals Pointless. Finally some modern pop and schlager mashup of the kind Helene Fischer masters to perfection. Easy to grasp, reasonably updated, most appealing. The problem here is that Jessica Andersson is not quite Helene Fischer, so to speak. Will this get too cold for the larger audiences? Kalle is the kind of performer that Stockholmers assume that everyone outside of Stockholm loves. He is a bubbly and likeable personality that works well in different tv shows, but he never seemed to go through the screen as a performer. This entry also feels very seen and heard before, like it had already been in MF 2010 or so. The big hot favourite and the one I really want to love. But. I don't see it after 60 seconds. Will this knock Sweden over somehow or is this a Kristin Amparo or Isa-I-Will-Wait situation coming up? Contemporary pop with cred performed by a girl isn't usually what the regular Swedish voter goes for. Another song expect to sail easily into the final. Maybe the short clips are playing tricks on me but I don't see the appeal here either. This whole formula feels very tired and Mendez himself makes the same sort of impression. Did Sweden really long for him to make a comeback? So I am confusion. 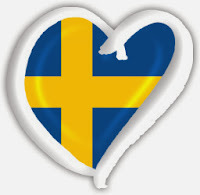 I have no idea what the people in Malmö - who say this is a super strong week - hear that eludes me in the short clips. For once I will assume they know better than I do. Tonight I won't live tweet but my impressions will sooner or later appear on Twitter. It was a pretty effective first week, especially show-wise. SVT has made quite a few decisions I pretty much agree with regarding the production. Above all, they are not trying to turn David Lindgren into the comedian he is not. Very wise. I suppose they will need to find a way to deepen Fab Freddie's role or we will be seriously fed up with him long before the final but otherwise most things worked. Initial reports suggested this second week was weak song-wise, so I heard the minute-long snippets with low expectations. And maybe that's the way it should always been done as I felt pleasantly surprised. Remember the old hit "You're my favourite waste of time"? That's how I feel about Samir & Viktor. Under no circumstances would I want them sent anywhere near the ESC but I liked their first two entries and I really enjoy this. Dumb but good-hearted and fun. A bit of a personal favourite in the making if this stays good for three minutes. I enjoy Ida's voice and I am a bit of a sucker for this kind of pop outside of the ESC bubble. However, it never works and the audience never votes for it. One of Jonas Gardell's main assets is a complete fearlessness about balancing on the verge of being totally pretentious and pathetic. He's one of the few who could enter with something like this without risking his reputation and this will be good promo for his coming show, but in no way is this a hit song in the making. Maybe I was the only one not to be surprised when Margaret failed in the Polish final in 2016, but I thought she was the weak spot of her entry then. Let's see if she improved, as this is a much warmer and appealing little piece of pop nonsense. Tobson approves. Every year one entry qualifies for MF through the Svensktoppen nästa talent search and every year this happens. A piece of music so obviously going to not be a contender that you keep asking yourself who allows this to go on. Sounds more like the weakest track on an album by Di sma undar jårdi (12 points if you get that reference) than an MF entry. Mimi would so deserve a big break as she has the voice and everything else you could wish for. This song is good but does it become too repetitive in the end? This could just as well be a surprise finalist as this week's number five. Instantly dubbed this week's sure qualifier by everybody else but I wouldn't be too sure. Here's a darkness that could be off-putting as well as a surprisingly lack-lustre staging. I'm not a huge rap connoisseur in any way, but doesn't it sound a bit... clichéd? This won't be the walk in the park some people expected it to be. Liamoo feels more like Andra Chansen than a finalist but I don't know who would beat him if so. If Margaret finds a lot of warmth and charm and nails the cameras, that could be it. Ida in fifth place is pure wishful thinking, but she deserves it more than Jonas Gardell. I will live tweet during Melodifestivalen and then catch up with Sanremo after that. Hello Melodifestivalen and hello my old blog. A new job and a full focus on my other blog - Tobson och alla bidragen - leaves me little time to write anything in English. But in order not to have the grass grow all over this place, I will be predicting Melodifestivalen and then have a look at the previews. Like I did last year too. This first review should come with a bit of a warning and a disclaimer. I am feeling more distanced and more detached about the Swedish final than I have in many years. I don't feel a need to be overly critical - SVT still puts on an effort that most other countries couldn't even imagine - but the musical direction of the whole thing is not exactly tickling my senses. Having said that, I listened to the minute-long clips on the SVT website and scribbled down a few thoughts. A very energetic opener is never a bad thing. People will enjoy this and maybe even vote for it without paying attention to the pretty weak voice (again hidden in layers and layers of prerecorded backing vocals) and some pretty lazy songwriting. Won't Sweden ever get tired of all the ooo's and aaa's and woohoo's thrown in instead of real lyrics? A traditional and well-crafted ballad - so much better songwriting all of a sudden - that attracted a surprisingly positive reaction from the audience in the dress rehearsal. It is attractive with singers who can actually sing and hopefully that will pay off in the end. Another entry that doesn't really do anything wrong. However, it only consists of bits and pieces from other already existing songs thrown together for the occasion. The song sounds like a million other songs and the singer sounds like a whole bunch of other singers. Enjoyable but it adds nothing of its own. Basically the visuals of the 2013 Swedish Smorgasboard interval act condensed into three minutes. Happy and upbeat but also puzzling. Why is this a competing entry and not a sketch between the songs? And will the Swedes really vote for a performance as mediocre as this? An artistic high point for Kikki who gets to showcase her new Americana self on prime time television and will make more people discover the terrific album she released the other year. Not mainstream enough to do really well but that is hardly the point either. The entry that has everything stacked up against it: a thin voice from a performer who is clearly not Swedish and who insists of hiding behind a mask, packaged in a confusing and unfocused performance. Shark feed in the voting but possibly a personal favourite in the making for me. Benjamin is a terrific singer and he also has a brilliant visual concept behind him. An easy qualifier tonight unless people find the thing a bit too slick and a bit too cold. The songs also needs to take off properly it some point - the "cute guy with a weak song but great visuals" was last year's trick. However, I hope that John will steal the final spot from Edward Blom and that Kikki would manage to make it into fifth place. And if Kamferdrops would somehow make it into top five, then I'd be all smiles all night. I will live tweet during the show - please share your thoughts with me.